Upon our arrival at Mammoth Village we were greeted by the site of several elk. 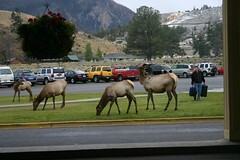 You could find the elk in the center of the village, around the visitor center, and the hotel, they were hard to miss. The elk weren't afraid of the vehicles or people, nor were the people afraid of the elk. 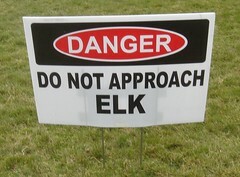 The park rangers were stationed around the elk and had to keep people a safe distance away, and the village had several signs warning of the danger. For some reason people felt no danger from these massive wild animals. We saw people walk right beside the elk without a second thought. We even saw a family park their car right next to the elk and get out of the car, the parents showed no concern when the barely walking toddler got out of the car and headed toward the elk, just feet away. No concern that is until the elk made took a couple aggressive steps toward the child. Our two day trip to Yellowstone Park took us through the park's only year round north entrance, boasting the historic Roosevelt Arch - dedicated by President Roosevelt on April 24th of 1903. From there it was a short drive and then a nights stay at Mammoth Hot Springs. The next day consists of a slow drive through the park with many stops and pictures along the way to our last nights stay at the Old Faithful Inn, followed by our exit out of Yellowstone's west entrance. The Museum of the Rockies was founded by Dr. Caronline McGill in 1957 and renowned paleontologist Jack Horner is the curator of paleontology at the museum. Known for its paleontological collections, the Museum contains the largest collection of dinosaur remains in the country, the largest Tyrannosaurus skull ever found and a Tyrannosaurus thigh bone containing soft tissue. The museum currently contains nearly 300,000 objects with collections in western history, textiles, Native American artifacts, and photography and details information spanning the earths 4 billion year history. As an affiliate of the Smithsonian Institution and a federal repository for fossils, the museum is not only a college-level division of Montana State University but it is also an independent 501(c)(3) nonprofit institution. 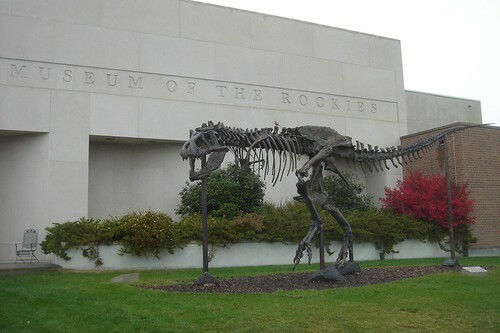 The Museum of the Rockies is approximately one of 750 museums accredited by the American Association of Museums. To put this in context there are more than 16,000 museums nationwide. The Museum of the Rockies is located on the south edge of the Montana State University campus at 600 West Kagy Boulevard in Bozeman Montana.